This is part of Beautiful Something Saturdays, where I look outward for something inspiring or interesting to share on a Saturday morning. Image courtesy of Joshua and Rachel Lickter. Driving down Folsom Road toward Vernon Street, in the old part of Roseville where freight trains still run along the railroad line as they have for the past 150 years and houses call no particular attention to themselves, you might notice something strange. Appearing unannounced and apropos of nothing in a front yard on the left, there’s a chair – a throne, really – carved out of an enormous redwood trunk, facing and looking out on the road below. It’s not a mirage, but a statement. To find out what it’s a statement of, I reached out to Rachel and Joshua Lickter via the chair’s own Facebook page. What do you know about the tree? The tree was the tallest in this section of Roseville. It originally stood over 130 feet tall and was over 100 years old. It was struck by lightning two years ago on Labor Day. The top 30 feet or so exploded. Much of it landed all over the neighborhood. We are thankful no one was hurt. There was damage to our roof and windows. We were hoping to keep the rest of the tree. Three weeks later and a rough wind, more branches fell causing more damage. Sadly the tree had to go. We worked hard with a local tree guy to take it down in sections. Those sections were then milled where they fell with an Alaskan sawmill. The slabs will be used in tables. They are drying in the tree guy’s warehouse. 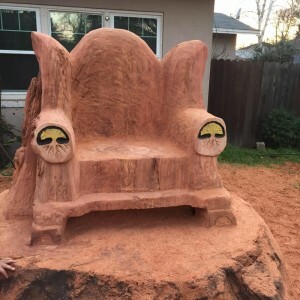 When and how did the idea to turn the stump into a chair come about? The idea for the stump came because we loved the tree and could not bear to see such a piece of history disappear. We had many ideas about what to do with it: A sculpture of a bear or even a little house. We wanted something that would draw people in and that they would need and want to interact with. How did you find the artist? It took a long time to find an artist, but my sister-in-law had a friend that was a famous tree sculptor, Jessie [Sunio Groeschen]. A link to her website is on the Facebook page. We had to wait until the wood was dry enough to carve. The area you’re in isn’t known for its quirky lawn art. There’s something about the unexpectedness of this that really seems to be bringing people together. What have you heard from neighbors? Overall, we’ve had nothing but positive [responses]. There was a little understandable annoyance from the saw noise. Everyone seems to like it. A passerby on the sidewalk looks up and sees a big, ornate chair carved out of redwood. What do you hope that person takes away from the encounter? We hope people feel intrigued and that it brings a smile to their face. We want to help make Roseville a welcoming and community place. We are opening a coffee shop on Vernon Street called The Fig Tree for just this purpose. We hope that it draws people out of their houses and causes us to interact more as a community. We will eventually have the tree open so people are free to just walk up and see it. The artist needs to finish some details and seal it. We will have a grand opening, so to speak, and the mayor is going to come. We also need to finish the landscape around it so that it is safe for people to walk [all the way] around it. To get more information on the chair, find out how to visit it (from the sidewalk, for now), and view photos of the artist at work, follow The Big Red Chair on Facebook. Must have been painful for the owners to lose such a tree; I am glad they honored it the way they did.